Karela is difficult to eat because of its bitter taste unless you have acquired its taste. From Ayurveda’s perspective it’s a very beneficial vegetable for stomach. Ayurveda recommends incorporating all the six tastes (sweet, sour, spicy, bitter, salty and astringent) in every meal. Bitter taste is the hardest to incorporate in a meal and karela helps in that. 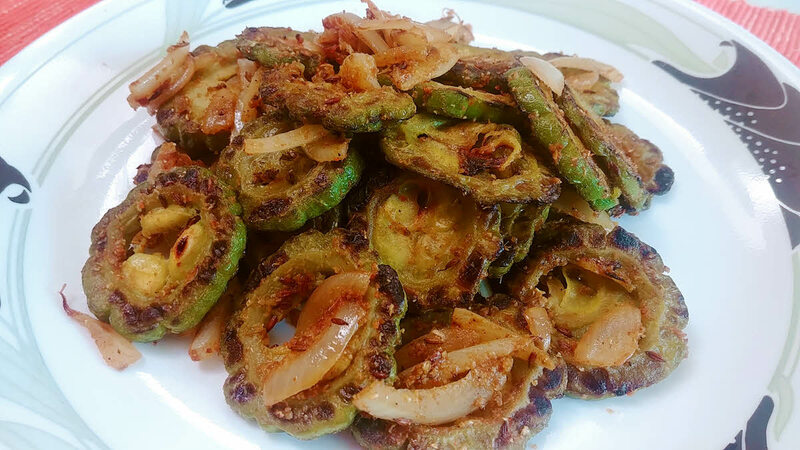 Karela Rings is a simple dry vegetable, which can be eaten with Dal, Rice and Roti. Since karela is a bitter vegetable, it’s also called bitter gourd. Wash bitter gourd and cut thick slices. Remove any hard seeds. Sprinkle some salt on it and let it rest for 30 minutes. This helps in removing some of the bitterness of the bitter gourd. Purists may say that you are reducing its goodness so it’s up to you. If you want to skip this step, you can. Chop onion in thick slices. Heat 1 tbsp of oil in the same pan. Add cumin seeds and wait till fragrant. Add onion slices and stir fry for a couple of minutes. We just want to make it limp, no browning required. Now add turmeric powder, chilli powder, coriander powder and stir till fragrant. Quickly add stir fried bitter gourd pieces and mix thoroughly. Reduce heat and gently saute for 5 minutes. Add dried mango powder and garam masala and mix thoroughly. Turn off the heat. Karela Rings are ready. Serve it hot as a side dish with Dal, Rice and Roti.